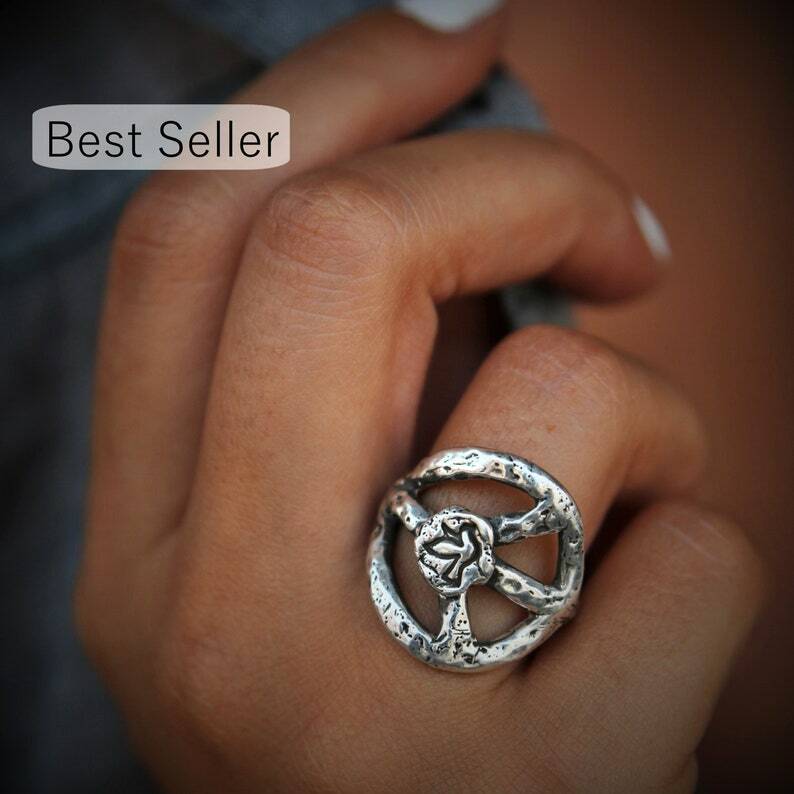 Hippie Fashion Accessories, Peace Sign Ring, Sterling Silver Hippie Jewelry: An oval shaped sterling silver peace sign is curved gently to fit your finger comfortably, dappled & sporadically pitted for a handmade artisan allure. An outline of a dove landing in the middle of the ring further underscores the message of “peace.” Three quarters unique & one quarter retro hippie flair equals a ring that is as delightfully different as it is beautiful, just like yourself. 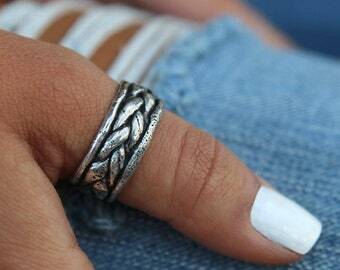 The exact size of the peace sign will vary a little depending on your ring size but expect it to be about 3/4" wide. It will be made upon ordering, one at a time, to ensure that hand crafted charm will shine through, similar to the photos. Stacked with your faves for a cool modern boho chic look or worn it on its own, let this sweet ring serve as your testimony to tranquility. Make love not war. Pass it on. And let your hippie flag fly. >>> This listing is for ONE peace sign ring. <<< Other jewelry is shown as examples of our work, offered for layering and stacking inspiration, and can be purchased in our shop. See links below. Available in whole & half US sizes 5-14. See drop down menu for pricing in your size. I fell in love with this ring while placing my first order! I knew I wld come back for it!!! Love...love...Love!!. Highly recommend “HappyGoLicky!! !